Please complete this form and hit SUBMIT to contact us regarding scheduling your donations. 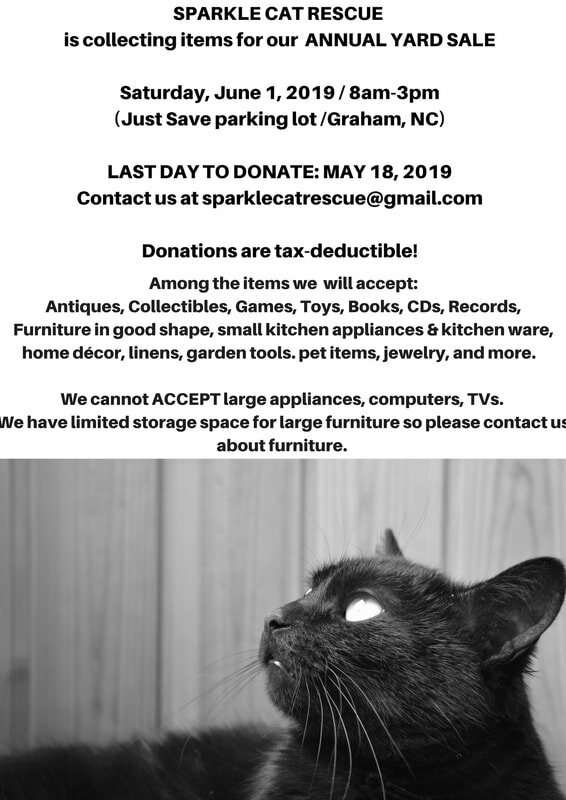 If you are absolutely unable to drop off donations on designated drop off days/times, please contact us at sparklecatrescue@gmail.com. We will work to have another volunteer meet you. ​Unless you have scheduled with one of our volunteers to drop off on designated days, please contact us because volunteers may not be at storage unless we know donations are coming. Please note if you schedule a drop off time, our volunteer(s) may be making a special trip to meet you at the storage unit so please be sure to contact us if you are unable to be at the unit when you schedule your time. Thanks! DROP OFF DONATION REQUEST - PLEASE FILL OUT THIS SECTION TO SCHEDULE TIME/DATE. - Volunteers to help load truck day before yard sale. Apply to volunteer by clicking the button below to be directed to a volunteer form.